Early start today with a lot of ground (water!) to cover. Off at 07:35 in a grey damp sort of morning, with a brisk wind from the north-west. The day brightened, but still punctuated by the odd drizzly shower blowing in the wind. We only saw 3 other moving boats all day, which meant that we could crack on through the Cheshire locks. We are moving like a well oiled machine now, Margaret never ceases to amaze me, how well she has taken to this major upheaval in her life. From Wheelock through to Harecastle the locks are all paired, but not all are in use! 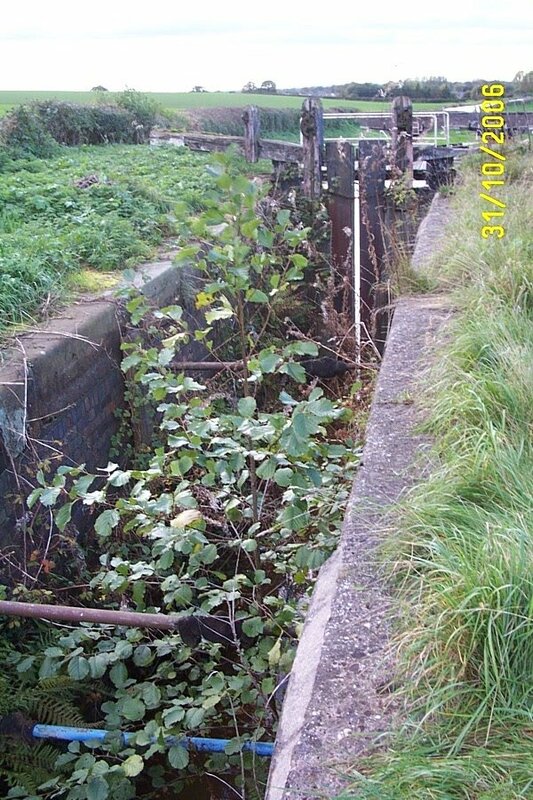 Derelict lock chamber at Church Lawton. We intended to stop near Church Lawton, but were doing so well decided to press on, although we had no chance of reaching Harecastle tunnel in time for the 15:00 deadline. Finally stopped at just after 15:00 near Red Bull. About 1 mile and 3 locks to Harecastle, must remember not to stoke to stove in the morning, naked flames are not allowed in the tunnel. Pity there’s going to be a frost tonight! It’s going to be a cold 2926 yards through there tomorrow. Our stay at OML did not start well. 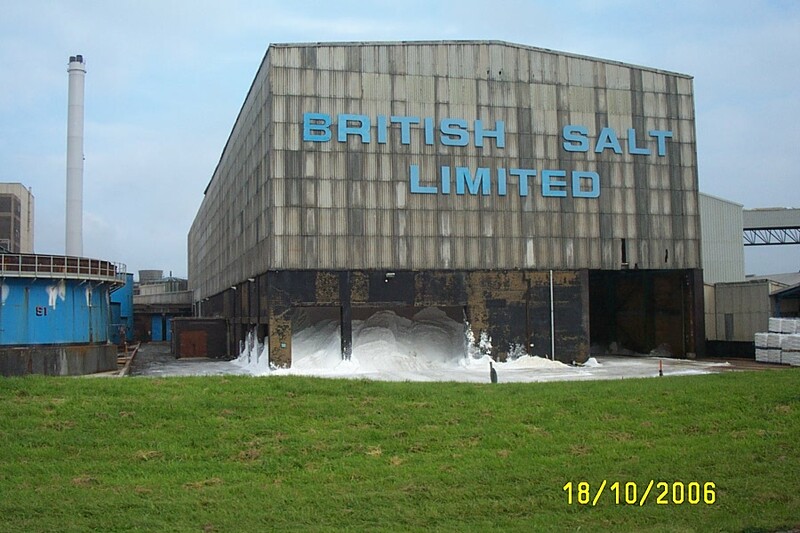 The first berth allocated to us was too shallow, the second was only available till Sunday night, and the third was on the services dock, which meant we spent Monday breasting customers boats alongside for diesel, water etc. Work started on Tuesday on the inverter, but was frequently interrupted. The carpentry to repair the damp damage was finished Saturday morning. After some more wiring mods, the inverter and remote control/battery monitor was up and running on Monday morning. We had a visit from George and Christine on Saturday 22nd, with the latest batch of mail. Included was my entry number and details for the Worksop ½ marathon. I had forgotten I had entered this one, so it was a bit of a surprise, especially as I hadn’t trained since the GNR a month before! Any way, we hired a car and set off for Worksop early last Sunday. With road closures and traffic hold ups we only just arrived in time for me to jog down to the start and get into the pack. So a combination of poor preparation on the day, inadequate training and being wound up from the 2½ hr drive led to an abysmal performance. I usually enjoy this run, through Clumber Park, but this year was no fun. Ah well, there’s always next year I guess. We had an enjoyable visit from Margaret’s sister Dot, husband John and son Paul on Saturday 29th. They hadn’t seen Seyella before, and were suitably impressed with the difference between this boat and the hire boat we shared some years ago on the Shroppie. 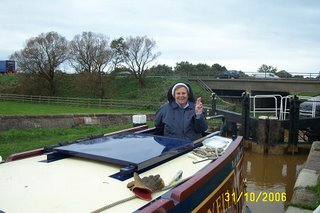 After filling with water, emptying the loo and filling the coal bunkers, we were off back down the Trent and Mersey at 12:30. 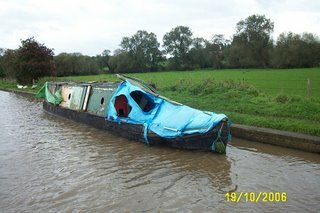 We’re going to have to go some to get back down the Soar to Sileby by next Saturday! 98 miles and 85 locks to go! Busy than we expected today, with a few boats heading south. A fine sunny afternoon, but with a cool breeze. Reached Middlewich not long after 14:00, and shared Big Lock with a family of swans! They didn’t give me a hand with the gates, though. 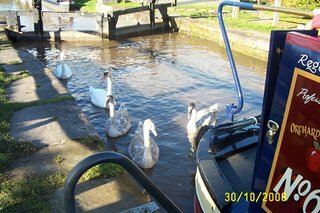 The next 3 locks were against us, but the boat we kept seeing in front of us must have set off down the Middlewich branch to the Shropshire Union, so we had Kings Lock in our favour. We pushed on up through Rumps, Booth Lane and Crows Nest locks, and stopped for the night near Elton Moss bridge (160) just at dusk at 17:00. It’s amazing what a difference putting the clocks back 1 hour makes! Margaret is really confident now, manouvering into locks. We have developed a different method when going uphill, which should avoid any more broken glasses! It’s good to be moving again, after an enforced 10 day lay-up. 9 Locks, 8½ miles. A good run in 4½ hours. Rain through the night and rain in the morning. It got better, however as the day progressed. We locked through 4 of the 5 Middlewich flight, and stopped next to bridge 172 so I could walk up to the Somerfield supermarket t o top up the stores. Bruno and I had already had a walk earlier to locate it. Through Middlewich Big Lock, and then just 4 miles to go before arriving back at Orchard. Spent an enjoyable 5 minutes watching a duck (sorry, haven’t a clue what it was) diving in front of the boat, then surfacing after 15 or 20 seconds, still in front of the boat. I wasn’t quick enough for a photo, though. Quite busy with boats heading south, I reckon we passed about 8 today. I don’t think this one’s going far for a while, though. Arrived at Orchard Marina at 13:10, and were directed to a berth. We are in illustrious company; J Peg, exhibited at Crick and featured in Canal Boat magazine, is moored about 30 feet away. We have arranged for the new inverter to be installed early next week, and the work on the bulkheads should start this weekend. We need to be away from here by next Thursday to have a chance of getting back down to Sileby for the 5th November, when we are meeting up with my sister, Sue, home from New Zealand. 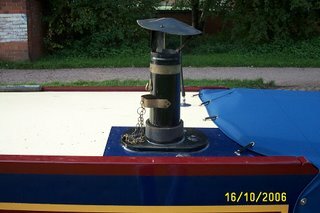 On the way past I’m going to leave the cratch cover with Reg at Boat Hoods Direct at Redhill, for some mods to make it less vulnerable to damage in narrow locks. Back to where we started, Orchard Marina just south of Northwich. Had a visitor last night – a young toad had moved in and made itself comfortable in Bruno’s bed. Liberated him back to the great outdoors. 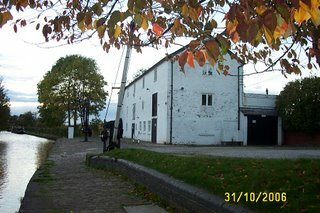 Set off at 09:35, with just 5 minutes to the first lock. Had a good run through today’s 12 locks, most of them in our favour. Rumps was a problem, though. Couldn’t open the top gate no matter how hard I tried. So enlisted the help of 43 BHP by hooking the bow line around the end of the gate and reversing the boat. Stopped for lunch and a bit of shopping at Wheelock, but did not fill up with water. The last time we did here, it was horrible. I thought the name was canal related, but it seems that it is derived from the Saxon for “winding river”. There is a river Wheelock just to the south of the village. 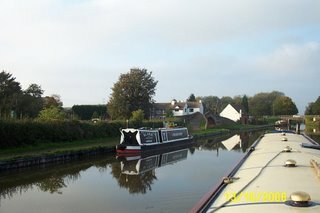 Finished the day on the edge of Middlewich, above Kings Lock. 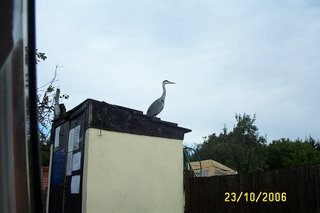 Would not normally moor so close to houses or a busy main road, but we’d promised ourselves fish and chips. Wish we hadn’t bothered, they weren’t as good as they have been in the past. Also we need to stock up with provisions before our internment at Orchard. Enough for several doses of hypertension. Relieved to say that Bruno is back to his old self today. We think maybe he had strained something, or pulled a muscle jumping on and off the boat. As I jogged between locks on the flights today, he was trotting along happily beside me. A great weight off our minds. We got up early, as we planned a heavy day, starting with Harecastle Tunnel and then carrying on with about 15 locks. We left at 07:35, and arrived at the tunnel at 08:05. We had to wait for a boat coming through from the north, but also I’d stoked the fire up, not thinking that naked flames are not allowed in the tunnel. So I had to empty it all. Still, I was able to save the fuel. We filled up with water while waiting, and entered the tunnel mouth at 08:45, on our own. A fast run saw us out and emptying the loo at the north end by 09:30. The new lamp (actually, an old chrome one I kept from my store of classic car parts), worked a treat. 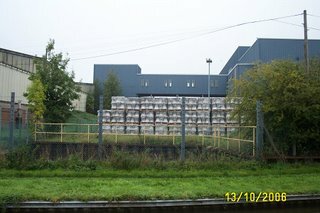 Got rid of rubbish at Red Bull, and had an easy run through 18, yes 18 locks, finishing just past Hassel Green. One minor incident in one of the Lawton flight when I had forgotten to close a ground paddle at the top of the lock before opening the gate paddles at the bottom. Caused some strange effects in the lock, but I sorted it out before affecting the water level in the pound. Lock 42 and Poole Aqueduct. 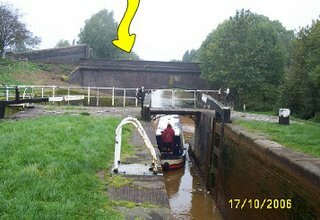 The spot (arrowed) is the head of the lady steering a boat across the aqueduct on the Macclesfield Canal. We had such a good run we moored up at 13:40. Rain started at about 16:00. A pleasant day at the Wedgewood mooring allowed me to get the other side of the boat painted below the gunwale. I’m glad to have got rid of the patches of primer I’d put on at Redhill. Now we’ve just got to avoid scraping it again. To be fair, trying to put a 6’ 10” boat into a 7’ 2” wide hole, from a distance of over 50’ away, often with a cross wind or an overflow stream pushing the boat sideways is a bit like threading a needle in sunglasses and mittons, in a gale. Bruno is a lot brighter this morning, up and taking notice. Still not yet 100% though Sunday’s rest seems to have done him good. We let the mooring at 09:50 and worked our way through Trentham lock and the Stoke locks. They were taking a long time to fill so I was opening both ground paddles at once. 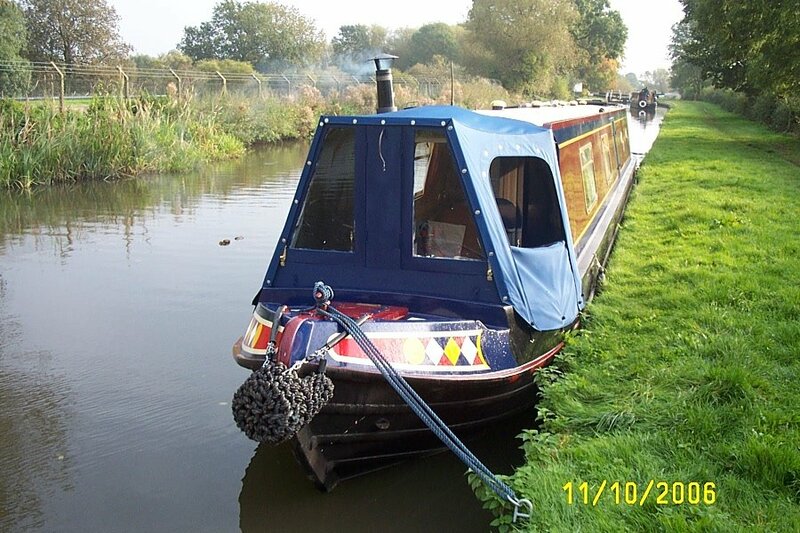 BIG mistake; I did the same when we got to Stoke top lock at Etruria junction which fills a lot quicker. The boat accelerated forward under the force of the incoming water, and hit the top gate with a jolt. A repeat of several weeks ago when we lost several glasses. This time was no different, but they were joined by the small teapot and a vinegar jar. My fault entirely. I’d not put the catches on the cabinets. After the locks I set off into town to B&Q to get some odds and ends. Squashed the chimney under a railway bridge in Stoke. It's not had a lot of luck - it has also spent 24 hours 8 feet down in the river Soar, till I could get a strong enough magnet on a string to lift it back out. Note the chain now fitted! We stopped at Westport Lake again, a lot quieter than earlier in the year. I moved the central heating controller from the engine room to a more convenient spot in the bedroom, and replaced the push fit fittings on the loo plumbing with conventional compression ones. Can now dispense with the saucer and sponge (see earlier post). Set off at 08:50, clearer morning today but overcast. Stopped in Stone for a bit of shopping. 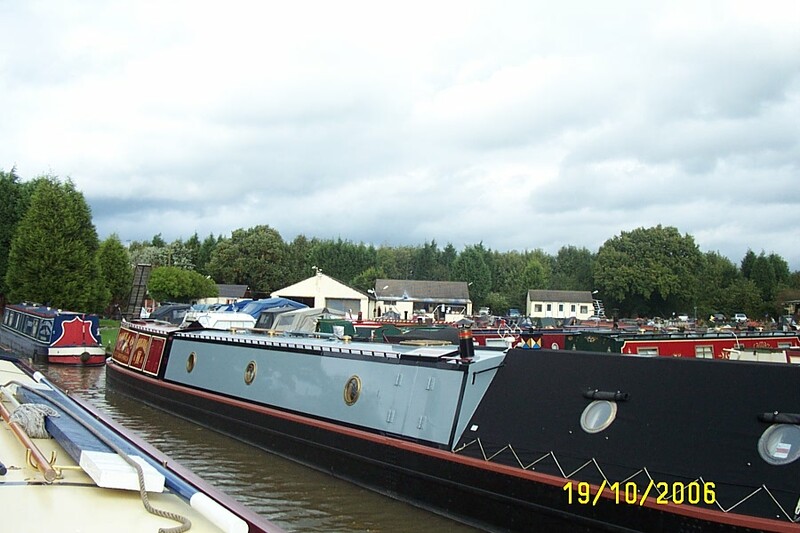 Like Tom Rolt in “Narrow Boat”, I like Stone, nice people and good shopping close to the canal even though 70 years have intervened. We bought some storage boxes to go under the well deck for fuel, they look tidier than plastic sacks. I am resisting stacking bags of coal on the roof, but may have to as we move into winter. Moved a little distance to Stone Boatbuilders to top up with diesel and get some solid fuel. We still seem to averaging around 1 litre an hour, running the heating or the engine. We finished another long day near the Wedgewood factory at bridge 104. Hard work today, all the locks seemed to be against us. There was very little traffic in either direction. Bruno is still looking unwell, he’s listless and uninterested in anything. He’s spending a lot of time sleeping. I’ve done an internet search for vets near Stoke, just in case. We’ve decided to stay here for Sunday, to give him a chance to rest. 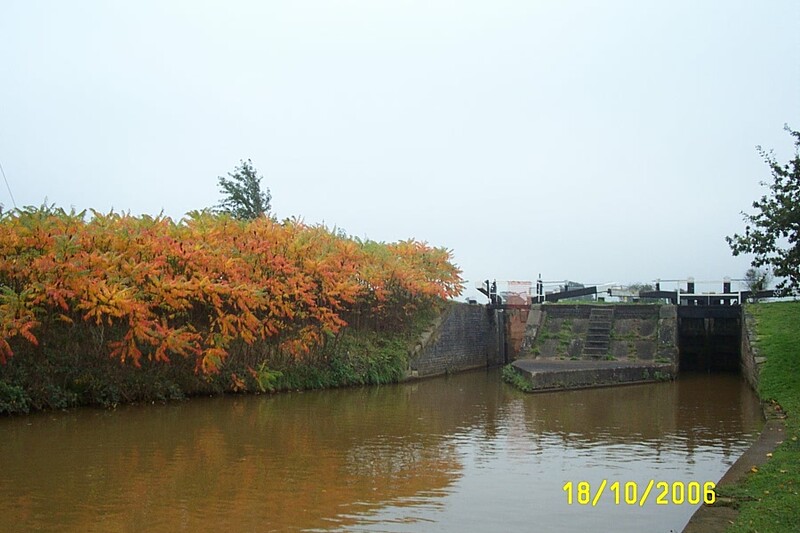 Left our overnight near Common lock at 08:50. Very misty autumnal morning, visibility down to about 50 yards. 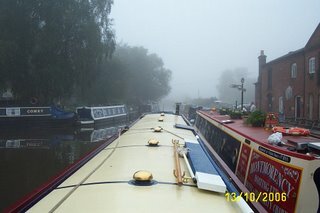 A very atmospheric run through Fradley, with the locks looming up out of the mist. Emptied the loo and rubbish, and topped up the water at the services, and carried on towards Armitage now heading Northwest. I didn’t get a picture of what they make at Armitage last time through….. Stopped at bridge 66 for a shop at Morrisons, mainly to make sure we had enough dog food for a while, then off past a very quite Great Haywood junction, finishing for the day just past bridge 77. Bruno is not so good today, maybe tired as he will not settle down when we are moving. We’ll keep an eye on him. The forecast for today was dry and bright, and for a change was correct. Cool morning, with a mist on the water when I took Bruno out for his morning walk. A really enjoyable run through Burton, past Barton Turn and through Alrewas. Quite a fast flow on the river section through the village, had to use a few revs to get across the stream to the lock. Had a problem with a sticking ground paddle at Wychnor lock, reported it to BW. Stopped quite early near Common lock, as most of the day we had locks in our favour. Took advantage of the pleasant evening and the low bank to paint the RH side of the hull below the gunwale. I had already prepared both sides while at Redhill. Set off from the mooring at 09:20, heading through Shardlow. Rain started about 10:00, and set the scene for the rest of the day. 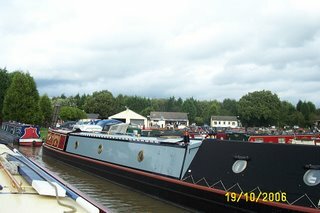 We took a 2 hour break after Weston lock to see if the weather would improve. The rain stopped, but started again as soon as we set off. A pretty miserable day generally, but at least the view is different heading back up the T&M. We wouldn’t normally travel in poor weather, but we are on a deadline to get back up to Northwich. Finished the day at Willington at about 17:45, and popped to the Co-op for supplies. At least the broad locks are out of the way. Max and Reg are not ready to start on the boat yet, so we left it in their hands, picked up a hire car and went across to see Dad and Ann and pick up the mail, which included my race number and entry details for the Great North Run. Had a restful day on Saturday, and set off north in the evening. In the past we’ve usually had a pitch booked on a caravan site near the finish, but obviously this isn’t an option this year. So we spent a poor night trying to sleep in the car (must get something a little bigger next time). Even so, I had a really enjoyable run, another PB this year, now doing ½ marathons in less than 1:53. OK, I’m not breaking any records, but it’s not so bad for an old ‘un. Contrary to the poor forecast, the weather was excellent, and only broke with a heavy shower as we were heading back to the car. Mag’s granddaughter, Zoe, had come up from Middlesborough with her family to see the race, it was good to see them. Instead of going straight back down to Redhill, we had arranged to stay Sunday night with Howard in Ingleton and catch up with everyone back home. After a shower and something to eat, we spent the evening going from house to house to see as many of the friends and family as possible. We left Yorkshire on Monday afternoon, arriving back at Redhill after dark. Max had the frame built and fitted on Wednesday, so Reg was able to start on the cover on Thursday, a little later than planned. I’ve never known a more laid back operation – canal time IS considerably slower than normal, but Redhill is in a world of it’s own. Still, nice people, a pleasant place to be, and what’s the rush anyway. While the guys were working on the front of the boat, we had decided to replace the carpets in the saloon and the bedroom with laminate flooring, a rather more practical proposition to keep clean. After 2 days (and 2 attempts!) got the saloon done to my satisfaction, so pulled up the carpet in the passage past the loo and the bedroom. Revealed a horrible damp patch on the floor, and rising 2 inches up the bulkheads. The water (luckily fresh, from the flush system) was leaking from 2 loose joints. One was quick to fix, requiring the tightening of a jubilee clip, the other needs a replacement fitting. The pipe work is HEP2O poly pipe, nothing wrong with that, but the joint assembly needs care. I’ve decided to replace the push fit fittings with standard compression ones, so will pick them up when I can. Meanwhile, a saucer to catch the drips and a sponge to empty the saucer will have to do. As we were on shore power, I dug the fan heater out of the bottom of the bed locker, and dried out the floor before fitting the new laminate. 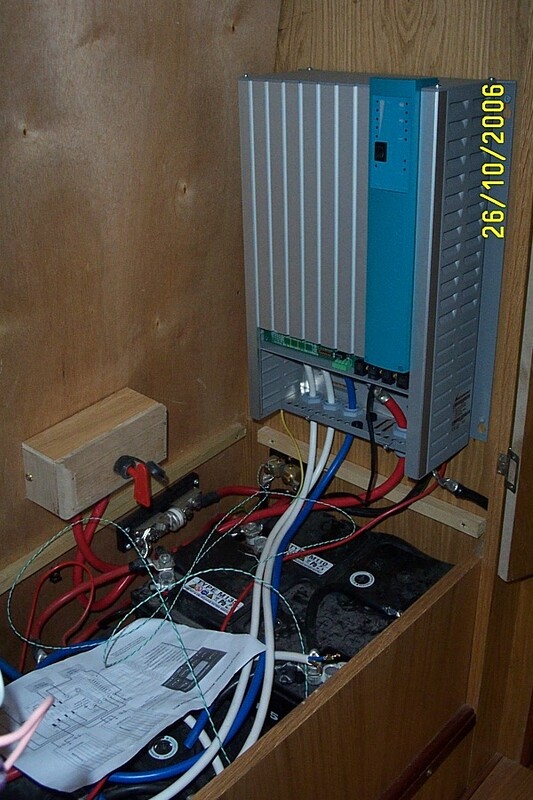 I’d picked up a car radio in Argos while we had the car, so I fitted that in the top face of the front corner cupboard. By Monday, Reg was nearly finished with the cover, so I did the engine checks ready for moving out on Tuesday. When checking the batteries, I noticed that the “odd” one, the extra one I asked to be fitted at the yard, was once again short of water, and is showing signs of swelling on the ends of the case, an indication of failure. With the charger off, the battery bank showed 13.4 volts, but with the bad one disconnected, the remaining 3 go up to 13.7 volts, and the disconnected one down to 12.8, and dropping. I rang Mike at Orchard and explained the problems, we will have them dealt with when we get back to Northwich later in the month. Finally got away from Redhill at 14:00 on Tuesday, and set off down the Soar and onto the Trent. Up through Sawley (no lock keeper on duty, so pushed the buttons myself. If only all locks were this easy! ), through Derwent Mouth lock and back onto the Trent and Mersey. Stopped for the night just East of Shardlow.